Non-invasive ventilation (NIV) is the delivery of ventilatory support without the need for an invasive artificial airway. Mechanical ventilation via intubation is associated with many complications, including upper airway trauma, arrhythmia, hypotension, aspiration of gastric contents, sinusitis, pneumonia, and patients' loss of ability to eat and communicate verbally. Non-invasive PPV (NPPV) is delivered through a nasal or face mask, eliminating the need for intubation or tracheostomy. NPPV can be given through a volume ventilator, a pressure-controlled ventilator, a bi-level positive airway pressure (BIPAP or bi-level ventilator) device, or a continuous positive airway pressure (CPAP) device. BIPAP, the most commonly used modality, provides continuous high-flow positive airway pressure that cycles between a high inspiratory positive airway pressure (IPAP) and a lower expiratory positive airway pressure (EPAP).1,2 Although positive pressure support is usually well tolerated by patients, mouth leaks or other difficulties are sometimes encountered. NIV may be used as a continuous or intermittent mode of assistance depending on the patient's clinical situation. Instantaneous and steady support is given to patients in acute respiratory distress. As the underlying condition improves, ventilator-free periods are increased as tolerated, and support is discontinued when the patient is deemed stable. The total duration of ventilator use varies with the underlying disease-approximately six hours for acute pulmonary edema, but more than two days for chronic obstructive pulmonary disease (COPD) exacerbation. NPPV decreases the work of breathing and thereby improves alveolar ventilation while simultaneously resting the respiratory musculature. The improvement in gas exchange with BIPAP occurs because of an increase in alveolar ventilation. Externally applied EPAP decreases the work of breathing by partially overcoming the auto-positive end-expiratory pressure (PEEP) as patients generate less negative inspiratory force to initiate the breathing cycle. In spontaneous mode, higher pressure is delivered upon detection of inspiration until the flow rate falls below the threshold level. The expiratory pressure with bi-level pressure support is equivalent to the PEEP, and the inspiratory pressure is equivalent to the sum of the PEEP and the level of pressure support. In timed mode, bi-phasic positive airway pressure ventilation alternates between the inspiratory and expiratory pressures at fixed time intervals, which allows unrestricted breathing at both pressures. Supplemental oxygen can be connected to the device, but a higher flow of oxygen therapy is then usually required. Effectiveness of NIV should be determined clinically through amelioration of respiratory distress, patient discomfort and improved results from arterial blood gas determinations.The decision to use a nasal mask or a full face mask depends on the patient's preference and tolerance. Patients who are in acute respiratory distress and are at risk of needing intubation should be selected for NIV if they have a reversible cause of acute respiratory failure.3,4 Most patients requiring NPPV should be managed in the intensive care unit (ICU) setting. Once stabilized, weaning from NPPV may be accomplished either by progressively decreasing the levels of positive airway pressure or by withholding NIV for increasing lengths of time. A combination of both strategies can also be used. Indications, contraindications, and factors predicting success are listed in Tables 1, 2, and 3. Patients with acute exacerbation of COPD (AECOPD) develop deterioration of gas exchange accompanied by rapid shallow breathing, severe dyspnea, right ventricular failure, and encephalopathy. Respiratory mechanical abnormalities lead to inadequate alveolar ventilation, shortened inspiratory time, diminished tidal volume, and increased respiratory frequency. NIV increases alveolar ventilation and reduces the loads imposed on the respiratory muscles. In acute respiratory failure in patients with COPD, NPPV offers a number of potential advantages over invasive PPV.5,6 These advantages include avoidance of intubation-related trauma, a decreased incidence of nosocomial pneumonia, enhanced patient comfort, a shorter duration of ventilator use, a reduction in hospital stay, and, ultimately, reduced healthcare costs. Studies on the use of NPPV in hypoxemic respiratory failure have yielded conflicting results. This category comprises patients with a variety of diagnoses, e.g. pneumonia, congestive heart failure, and acute respiratory distress syndrome.14-16 Uncontrolled studies have suggested that some patients with hypoxemic respiratory failure may respond favorably to NPPV. In one study of 64 patients with hypoxemic respiratory failure, NPPV reduced the duration of mechanical ventilation (three versus six days), the length of ICU stay (three versus six days), and serious complications.17 Another study compared BIPAP with high-flow oxygen therapy in patients with acute hypoxemic respiratory failure. NPPV was associated with decreased need for intubation (25% versus 52%), improved ICU mortality (18% versus 39%) and increased 90-day survival.18 Although these results appear to be encouraging, the use of NPPV in patients with hypoxemic respiratory failure requires further investigation before its widespread clinical use. Although controlled studies are lacking, several case series report successful NPPV use in acute asthma, cystic fibrosis, respiratory deterioration following extubation, and as a method of weaning patients from invasive ventilation.19-21 The exception is acute pulmonary edema, where CPAP has been shown to be an effective therapy for improving gas exchange, decreasing respiratory work, and reducing the rate of endotracheal intubation.22 In a controlled study, nasal BIPAP improved the partial pressure of carbon dioxide in arterial gas (PaCO2) levels, pH, respiratory rate, and dyspnea more rapidly than nasal CPAP in patients with acute pulmonary edema.23 CPAP may appear to be a logical first choice in the treatment of these patients; however, patients with hypercapnia or continued respiratory distress on CPAP should be switched to BIPAP.24,25 Patients with acute or chronic respiratory failure secondary to obesity hypoventilation syndrome may be treated with NPPV or, if intubated, may be weaned from invasive ventilation to NPPV support.26,27 These patients require ventilatory support, initially 24 hours a day and, subsequently, night-time weaning via NPPV appears to be an excellent option. Nocturnal NIV is an effective treatment for hypercapnic respiratory failure in patients with restrictive thoracic disease. Respiratory failure is reversed by increasing the ventilatory response to CO2, reducing inspiratory muscle fatigue, or enhancing pulmonary mechanics. Several uncontrolled and controlled studies have demonstrated that even patients with severe CO2 retention and symptoms such as morning headache and daytime hypersomnolence could undergo remarkable reversal after several weeks of nocturnal NIV.28-30 Longterm survival of patients on NPPV who develop chronic respiratory failure because of restrictive thoracic diseases is comparable with survival of those patients who use invasive PPV. However, NPPV is associated with fewer deaths. NPPV should be initiated at the onset of daytime hypoventilation and symptoms as early institution may be advantageous in slowing the progression of respiratory failure. At later stages, invasive PPV may need to be instituted, although on-going use of NPPV has been advocated. 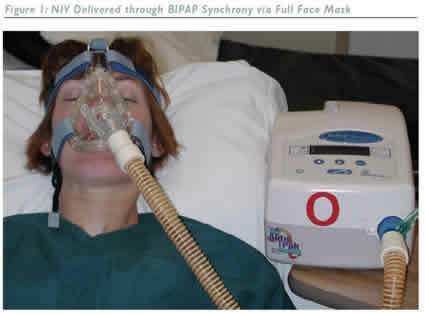 The most common nuisance with NPPV is local damage to the facial tissue from pressure effects of the mask and straps. Mild gastric distension may occur, but is not significant; removal of the nasogastric tube is not warranted. Eye irritation and sinus pain or congestion may also occur. Barotrauma is uncommon, but adverse hemodynamic effects from NIV may occur. Modest air leaks at the facial seal are common, but are tolerated and of no consequence. Patients on NPPV must be carefully monitored for patient comfort, worsening respiratory distress, and hypoxemia. For a variety of reasons, NIV is not always successful. Indicators of failure, such as hemodynamic instability, deteriorating mental status, and an increasing respiratory rate should be closely monitored. More clinical research is needed before NPPV can be used to its greatest advantage in respiratory failure from a wide variety of causes. Advances in interface and ventilator technology will likely enhance patient tolerance. The recent increase in NPPV use in acute case settings has been encouraged by the desire to reduce the complications arising from intubation and invasive ventilation.Although NIV has well-established efficacy in AECOPD, acute pulmonary edema, and restrictive neuromuscular disorders, further research is needed to define its role in hypoxemic respiratory failure and other causes of acute and chronic respiratory failure. Sharma S,"Non invasive Ventilation", http://www.emedicine.com/med/topic3371.htm (accessed on November 30 2005). Mehta S, Hill N S, "Noninvasive Ventilation: State of the art", Am. J. Respir. Crit. Care Med. (2001);163: pp. 540-577. Brochard, Mancebo J, Elliot M W,"Noninvasive ventilation for acute respiratory failure", Eur. Respir. J. (2002);19(4): pp. 712-721. Phua J, Kong K, Lee K H et al., "Noninvasive ventilation in hypercapnic acute respiratory failure due to chronic obstructive pulmonary disease vs. other conditions: effectiveness and predictors of failure", Intensive Care Med. (2005);31(4): pp. 533-539. Ambrosino N, Foglio K, Rubini F et al.,"Non-invasive mechanical ventilation in acute respiratory failure due to chronic obstructive pulmonary disease: correlates for success", Thorax (1995);50(7): pp. 755-757. Keenan S P, Kernerman P D, Cook D J et al.,"Effect of noninvasive positive pressure ventilation on mortality in patients admitted with acute respiratory failure: a meta-analysis", Crit. Care Med. (1997);25: pp. 1,685-1,692. Brochard L, Mancebo J,Wysocki M et al., "Noninvasive ventilation for acute exacerbations of chronic obstructive pulmonary disease", N. Engl. J. Med. (1995);333: pp. 817-822. Plant P K, Owen J L, Elliot M W,"Early use of non-invasive ventilation for acute exacerbations of chronic obstructive pulmonary disease on general respiratory wards: a multicentre randomised controlled trial", Lancet (2000);355: pp. 1,931-1,935. Appendini L, Patessio A, Zanaboni S et al. "Physiologic effects of positive end-expiratory pressure and mask pressure support during exacerbations of chronic obstructive pulmonary disease", Am. J. Respir. Crit. Care Med. (1994);149(5): pp. 1,069-1,076. Bott J, Carroll M P, Conway J H et al.,"Randomised controlled trial of nasal ventilation in acute ventilatory failure due to chronic obstructive airways disease", Lancet (1993);341(8,860): pp. 1,555-1,557. Bersten A D, Holt A W,Vedig A E et al., "Treatment of severe cardiogenic pulmonary edema with continuous positive airway pressure delivered by face mask", N. Engl. J. Med. (1991);325(26): pp. 1,825-1,830. Brochard L, Isabey D, Piquet J et al.,"Reversal of acute exacerbations of chronic obstructive lung disease by inspiratory assistance with a face mask", N. Engl. J. Med. (1990);323(22): pp. 1,523-1,530. Celikel T, Sungur M, Ceyhan B et al., "Comparison of noninvasive positive pressure ventilation with standard medical therapy in hypercapnic acute respiratory failure", Chest (1998);114(6): pp. 1,636-1,642. Ferrer M, Esquinas A, Leon M et al., "Noninvasive ventilation in severe hypoxemic respiratory failure: a randomized clinical trial", Am. J. Respir. Crit. Care Med. (2003);168(12): pp. 1,438-1,444. Delclaux C, L'Her E,Alberti C, Mancebo J,Abroug F, Conti G et al.,"Treatment of acute hypoxemic nonhypercapnic respiratory insufficiency with continuous positive airway pressure delivered by a face mask: A randomized controlled trial", JAMA (2000);284(18): pp. 2,352-2,360. Hilbert G, Gruson D,Vargas F et al., "Noninvasive ventilation in immunosuppressed patients with pulmonary infiltrates, fever, and acute respiratory failure", N. Engl. J. Med. (2001);344(7): pp. 481-487. Antonelli M, Conti G, Rocco M et al., "A comparison of noninvasive positive-pressure ventilation and conventional mechanical ventilation in patients with acute respiratory failure", N. Engl. J. Med. (1998);339: pp. 429-435. Wood K A, Lewis L,Von Harz B et al.,"The use of noninvasive positive pressure ventilation in the emergency department: results of a randomized clinical trial", Chest (1998);113: pp. 1,339-1,346. Meduri G U, Cook T R, Turner R E et al., "Noninvasive positive pressure ventilation in status asthmaticus", Chest (1996);110(3): pp. 767-774. Granton J T, Kesten S, "The acute effects of nasal positive pressure ventilation in patients with advanced cystic fibrosis", Chest (1998);113(4): pp. 1,013-1,018. Ferrer M, Esquinas A, Arancibia F et al., "Noninvasive ventilation during persistent weaning failure: a randomized controlled trial", Am. J. Respir. Crit. Care Med. (2003);168(1): pp. 70-76. Nava S, Carbone G, DiBattista N et al., "Noninvasive ventilation in cardiogenic pulmonary edema: a multicenter randomized trial", Am. J. Respir. Crit. Care Med. (2003);168(12): pp. 1,432-1,437. Mehta S, Jay G D,Woolard R H et al., "Randomized, prospective trial of bilevel versus continuous positive airway pressure in acute pulmonary edema", Crit. Care Med. (1997);25(4): pp. 620-628. Crane S D, Elliot M W, Gilligan P et al., "Randomised controlled comparison continuous positive airways pressure, bilevel noninvasive ventilation, and standard treatment in emergency department patients with acute cardiogenic pulmonary edema", Emerg. Med. J. (2004);21: pp. 155-161. Mossip J, Paez J, Merino M et al.,"Risk factors for intubation as a guide for noninvasive ventilation in patients with severe acute cardiogenic pulmonary edema", Intensive Care Med. (2003);29: pp. 1,921-1,928. Masa J F, Celli B R, Riesco J A et al., "The obesity hypoventilation syndrome can be treated with noninvasive mechanical ventilation", Chest (2001);119(4): pp. 1,102-1,107. Perez de Llano L A, Golpe R, Ortiz Piquer M et al., "Short-term and long-term effects of nasal intermittent positive pressure ventilation in patients with obesity-hypoventilation syndrome", Chest (2005);128(2): pp. 587-594. Nickol A H, Hart N, Hopkinson N S et al.,"Mechanisms of improvement of respiratory failure in patients with restrictive thoracic disease treated with non-invasive ventilation", Thorax (2005);60(9): pp. 754-760. Ergun P,Aydin G,Turay UY et al.,"Short-term effect of nasal intermittent positive-pressure ventilation in patients with restrictive thoracic disease", Respiration (2002);69(4): pp. 303-308. Leger P, Jennequin J, Gerard M et al., "Home positive pressure ventilation via nasal mask for patients with neuromusculoskeletal disorders", Eur. Respir. J. Suppl. (1989);7: pp. 640s-644s. Sat Sharma, MD, FRCPC, FCCP, FACP,is Associate Professor in the Sections of Respirology and Critical Care of the Department of Internal Medicine at the University of Manitoba, Winnipeg, Canada. He is also Program Director of postgraduate education in respirology at the same university and Site Director of respiratory medicine at St Boniface General Hospital. 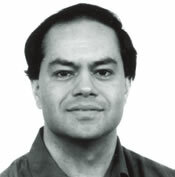 Professor Sharma's other national and international appointments include Chair of the Specialty Committee in Respirology of the Royal College of Physicians and Surgeons of Canada (RCPSC), Governor of the Manitoba chapter of the American College of Chest Physicians (ACCP), member of the Health and Science Policy Committee of the ACCP, and member of the Canadian Thoracic Society Board. Professor Sharma's research interests involve studying the epidemiology of respiratory diseases, perioperative respiratory care, exercise-induced hypoxemia, and therapeutic clinical research.